Home / ANIMATED FILMS / FILM POSTERS / SUPERHEROES / New One-Sheet Art Arrives for "The LEGO Batman Movie"
New One-Sheet Art Arrives for "The LEGO Batman Movie"
Check out the one-sheet below and watch the film when it opens in the Philippines on February 9, 2017. “The LEGO® Batman Movie” is directed by Chris McKay, and produced by Dan Lin, Phil Lord, Christopher Miller, and Roy Lee, who worked together on “The LEGO Movie.” It is written by Seth Grahame-Smith and Chris McKenna & Erik Sommers, with additional screenplay material by Jared Stern & John Whittington, based on LEGO Construction Toys. Jill Wilfert, Matthew Ashton and Will Allegra serve as executive producers. 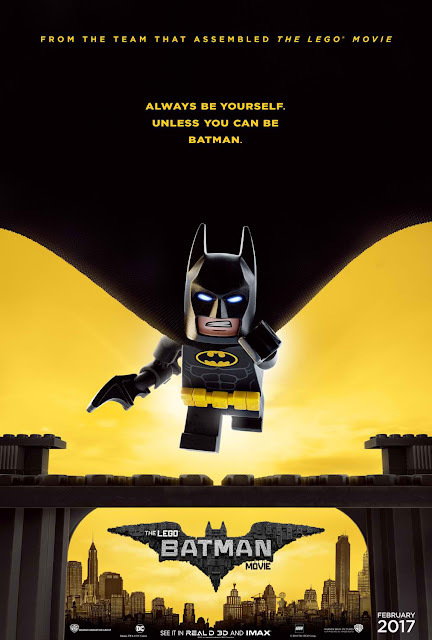 From Warner Bros. Pictures and Warner Animation Group, in association with LEGO System A/S, a Lin Pictures / Lord Miller / Vertigo Entertainment production, “The LEGO Batman Movie” is distributed in the Philippines by Warner Bros. Pictures, a Warner Bros. Entertainment Company.